YFCU members taking part in the tag rugby final sponsored by Danske Bank. The final of the YFCU’s annual tag rugby tournament, in association with platinum sponsor Danske Bank, took place on Tuesday, July 31, at Rainey Endowed School, Magherafelt. The action kicked off with winning teams of the junior county heats taking to the pitch. The top two teams from each league made it through to the semi-finals which resulted in Kilraughts YFC and Seskinore YFC going head to head in the final. Senior Tag Rugby Winners, Annaclone and Magherally YFC pictured collecting the Adrian Cooper Shield from YFCU President, James Speers and Robert McCullough, Head of Agri Business at Danske Bank. Following an exciting final, Kilraughts YFC picked up the Rosemary Cooper shield and the YFCU Tag Rugby 2018 junior title. The senior section of the tournament followed with the winners of the senior county heats taking part in two leagues. The top two teams from each league made it through to the semi-finals which resulted in Randalstown YFC facing Annaclone and Magherally YFC in the final. Annaclone and Magherally YFC emerged victorious and received the Adrian Cooper Shield and YFCU Tag Rugby 2018 senior title. 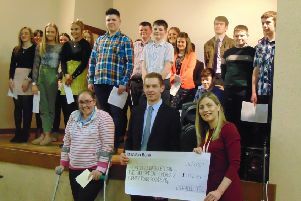 YFCU President James Speers announced the winners and Robert McCullough, Danske Bank’s Head of Agri Business, presented the Rosemary Cooper and Adrian Cooper shields as well as the commemorative medals kindly provided by the bank. Junior Tag Rugby winners, Kilraughts YFC pictured collecting the Rosemary Cooper Shield from YFCU President, James Speers and Robert McCullough, Head of Agri Business at Danske Bank. Fair play awards were presented to Randalstown YFC and Glarryford YFC 2 (juniors) and Kells and Connor YFC and Moycraig 1 YFC (seniors) for the courtesy and respect they showed towards their team mates, opposition and referee. The YFCU would like to take this opportunity to thank Danske Bank for their continued support of this YFCU event and also thank the referees who attended the finals; Gavin Wray and Bruce Henry alongside Robbie Watson, and Tony Henry from Ulster Rugby. Thanks were also extended to the final stewards who ensured that the competition ran smoothly; Jessica Reid, Cathy Reid, Heather Stewart and Emma Johnston.